The phrase "entry-level luxury" is something of a misnomer when it comes to the new 2014 Acura ILX. While labeled as such, its amenities, features and overall quality suggest something quite luxurious. Released as an all-new model in 2013, the ILX redefined the upscale sport sedan segment as an affordable vehicle that is host to impeccable styling, the latest technologies and powerful powertrain options. For the new model year, 2014 Acura ILX shoppers in the Phoenix area will enjoy additional standard features like leather seats, heated front seats, 17-inch wheels, a power driver seat and much more. The new 2014 ILX is your gateway to a higher standard of luxury and performance - and a highly recommended pick for anyone new to the brand. The 2014 Acura ILX is available in Phoenix, Peoria and Valley-wide in four trim levels: 2.0, 2.0 Premium, 2.0 Technology and 2.4 Premium. Along with these options, an all-new Acura ILX Hybrid will be on lots across Arizona toward the end of 2013. All 2.0 trim levels come standard with a 2.0-liter four-cylinder engine that delivers 150 horsepower and 140 lb.-ft. of torque, and is paired to a five-speed automatic transmission. While this engine will meet most drivers' needs, the real "sport" element in the ILX comes alive through the 2.4-liter four-cylinder that generates 201 horsepower and 170 lb.-ft. of torque. This powertrain is only available on the 2.4 Premium trim level and comes with a six-speed manual transmission only. With a base price of under $27,000, the 2014 ILX is very impressive in terms of interior comforts and amenities, as is noted in countless Acura ILX reviews this year. New standard features include: leather seats and leatherette door liners, heated front seats, 17-inch alloy wheels, an eight-way powered driver's seat, a multi-angle rearview camera and an enhanced audio system with Active Noise Cancellation. Other standard and optional features include: keyless entry/push-button start, cruise control, a sunroof, dual-zone automatic climate control, navigation, full power accessories and more. 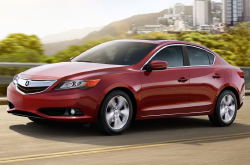 Keep reading the 2014 Acura ILX review below or contact Acura of Peoria for more information.